Hotel Motel 6 MT. Jackson - Shenandoah, Mount Jackson, United States of America - Lowest Rate Guaranteed! Located in Mount Jackson, Motel 6 MT. Jackson - Shenandoah is within a 10-minute drive of Meems Bottom Covered Bridge and Yellow Barn at Shenandoah Caverns. 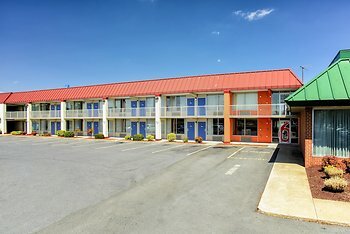 This motel is 5.4 mi (8.7 km) from George Washington National Forest and 22.4 mi (36 km) from Luray Caverns. I truly appreciate the office people accommodating my “special needs” They went above and beyond. The staff was very good at all hours. The Denny's restaurant was also very handy and very good. The motel breakfast was just like home in having the juice and cereal we eat. The hotel was much better than I expected given its one star rating. The young man working the check in, 'Robert, was very polite and accommodating. How quiet the hotel was so near the interstate! The key cards did not work on the 3rd day and had to be reprogrammed. THE INSIDE TOP OF THE ICE CONTAINER WAS VERY DIRTY. OTHERWISE ALL WAS OK. HATE IT THAT DOG FRIENDLY ROOMS ARE ALWAYS NOT AS NICE AS OTHERS. No problems. Great breakfast in restaurant. The staff was very helpful and friendly and efficient. The location is convenient and has nearby eating options. Logos, brands, and other trademarks featured within this site are the property of their respective trademark holders. These trademark holders are not directly affiliated with Hotelsone. Motel 6 is a registered trademark.© 2001 - 2019 HotelsOne. All rights reserved.